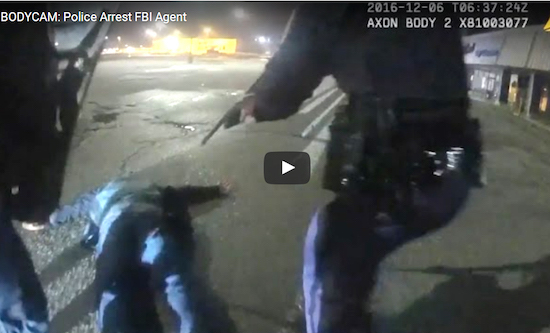 Newly released footage shows the intense moments following shots fired at a Grand Rapids police officer by an FBI agent. The shots were fired around 1:20 a.m. on Dec. 6 near the Planet Fitness, located at 3681 28th Street SE, east of the East Beltline. Officers were called there after the suspect was seen with a firearm. Authorities say the man shot at a police sergeant when he tried to speak with the suspect outside. Police body camera video, which was obtained by 24 Hour News 8 through the Freedom of Information Act, shows officers — some in tactical gear — as they approach agent Ruben Manuel Hernandez, 35, who was already on the ground and his gun was in the parking lot. Another video from inside police cruiser a shows the interview with Hernandez after he was arrested. “Anybody that is wearing a uniform, I will not hurt you,” said Hernandez. “Here is the thing, you have a holster on you. There is a gun in the parking lot in the direction you came. You took a shot at one of our officers. You aren’t going anywhere. You are going to stay in the car until someone can talk with you,” an officer said. “Ma’am, can you take (the handcuffs) off for me?” Hernandez asked. His attorney said Hernandez may have had a “paranoid” episode at the time of the incident. He said alcohol may have played a factor. Hernandez, who came to Grand Rapids from Las Vegas to conduct interviews on an undisclosed case, is facing assault with intent to do great bodily harm less than murder, felonious assault and brandishing a weapon in public charges.